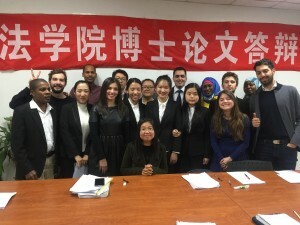 The LLM student of BNU Law School, international students of LLM in Chinese and international visiting students participated in the international Moot Court on copyright disputes in universities at the end of 2016. The Moot court was organized by Prof. Xue during her teaching of Intellectual Property Law to both groups of the students. The case for the Moot Court was adapted from the real case between a US publisher and an Indian university. Prof. Xue redesigned and rewrote the facts of the case and made it a case between a group of western publishers and BNU. The case that hypothetically happened on BNU campus triggered great interests from both Chinese and international students, both of whom made comprehensive preparation for the Moot Court, including collecting evidence, compiling case materials and deposition of witnesses. At the Moot court session, both parties made persuasive arguments and in-depth legal analysis, which showed that they were able to utilize the knowledge they learned during the course to practices. The moot court was conducted in English and 12 international students from Italy, Iran, Tanzania, France and Spain prevailed in the legal debate. The grant jury comprising of the representatives from both group was hardly reach the verdict unanimously and had to be subject to the final ruling of Prof. Xue. It’s an interesting and successful experiment for all the participants.